The 37' President Sundeck has a wonderful layout with two private sleeping cabins, plenty of storage, stunning wood cabinetry and teak and holly flooring throughout. Features include a beautiful spacious aft cabin with queen island bed, salon with large windows, fully appointed galley with full sized fridge, stove and oven, large, convertible dinette, two heads and a very generous stateroom forward. 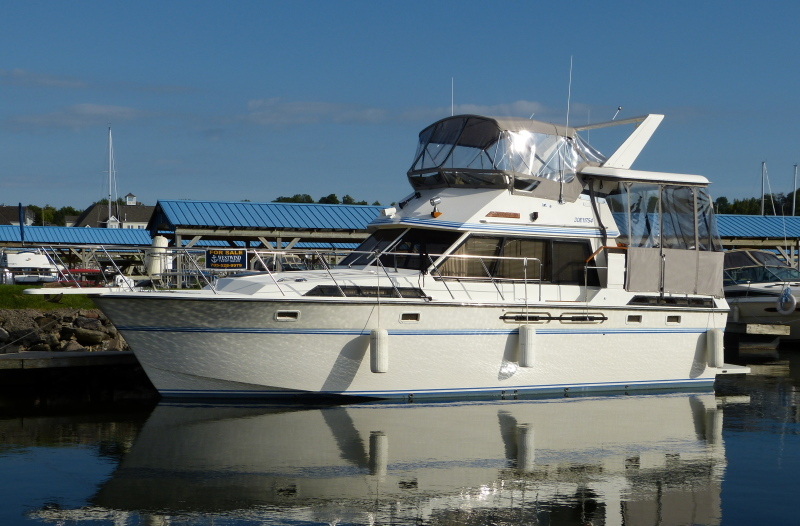 This 37 President offers exceptional value with an epoxy bottom, fiberglass grid stringer system, low hours, upgraded upholstery, new canvas, re-cored decks and much more! Professional upgrades and new canvas were completed in 2015, and this boat is now ready for new owners and years of stylish boating at a fraction of the cost of comparable later model aft cabin cruisers.